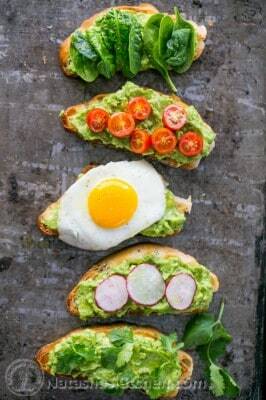 Easy and healthy; you are going to love these open faced avocado sandwiches! Imagine biting into a generous layer of avocado spread and through crusty toast with that subtle crunch... you can't help but close your eyes and smile. It's a good idea to keep a stash of tried-and-true quick recipes for really busy or lazy days. These sandwiches can be assembled in under 10 minutes and they are perfect for breakfast, brunch, lunch or dinner. Oh and if you're a late night snacker, you should keep these in mind. I'm sharing 5 of our favorite toppings but you can make these sandwiches with nearly anything you can dream up. They're so easy and tasty. That drizzle of extra virgin olive oil at the end is delicious; don't skip it. P.S. Make the avocado sandwiches even healthier by using multi-grain or whole wheat bread. In a medium bowl, mash together 2 ripe avocados. A potato masher is the fastest route. Stir 1/8 tsp salt (or to taste) and 1 tsp fresh lemon juice into the mashed avocados until well combined. Lightly toast your sliced bread (if desired) with a small pat of butter until the edges are golden brown. Add a generous layer of avocado spread over each piece of toast. Add your desired toppings, then drizzle each piece of toast with extra virgin olive oil and top with freshly cracked black pepper. So so good!